April 11, 2019: When Philippe Cassegrain created Le Pliage® by Longchamp back in 1993, he was inspired by the ancient Japanese art of origami. 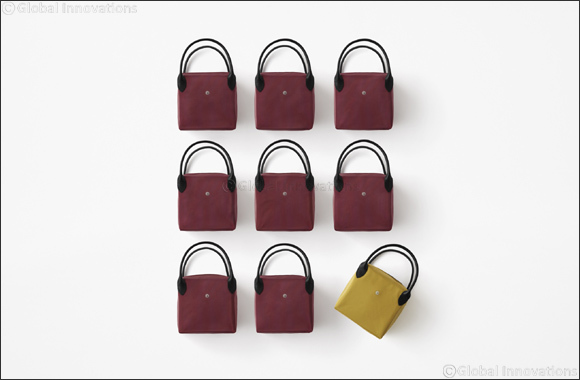 Now a new collaboration, initiated by the next generation of Longchamp's founding family, brings the iconic foldable bag full circle, as it is reinterpreted by the Tokyo-based design studio nendo. While the classic Le Pliage® offers two distinct experiences – one when it is carried as a bag, the other when it is folded away – nendo's designs introduce a third experience, reimagining the bags as functional, aesthetically pleasing storage objects to be placed around the home. The cone and circle bags come in two sizes, and the cube bag in three, in a palette of six shades which Sophie Delafontaine describes as “coloured neutrals”. Options including pale grey, dark blue, mustard and burgundy, with white or black trim, strike an elegant balance between nendo's predominantly monochrome aesthetic and the paint-box brights of Le Pliage®. The cone bag is also available as a limited edition in supple black lambskin, which nods to the classic Le Pliage® Cuir. Next Story : Modesty meets festive spirit in Diva Abaya's Ramadan collection.